It's been awhile since my last post. Good to be back in the saddle again! 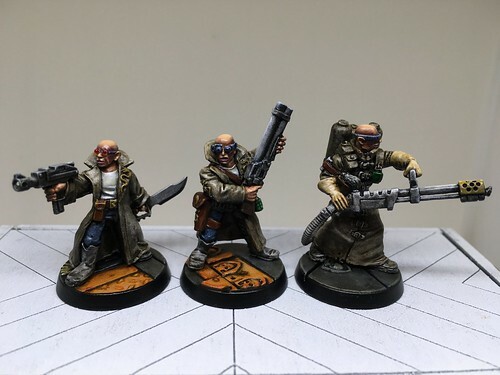 I have enjoyed being Arbitrator (game master) for the ongoing Necromunda campaign we have been playing. 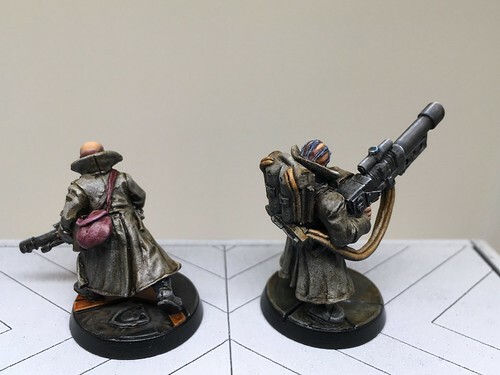 I wanted to get another gang to go with my Spyrers, so I could always have a game with someone who doesn't have the figs, and to provide a different set of opponents for "bye" games in the campaign. 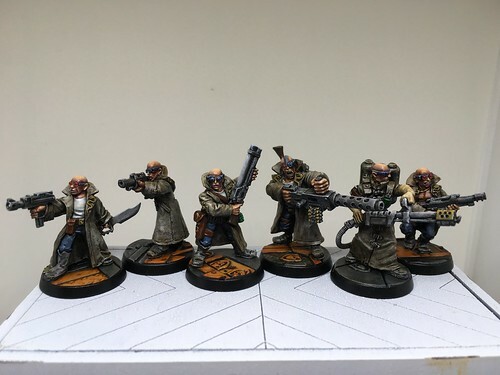 I liked the look of Dallas' gangers from House Delaque. 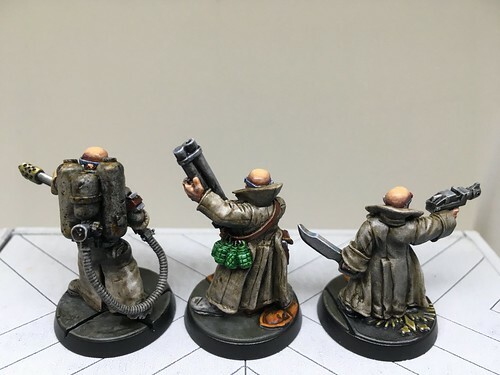 So, I have started collecting a Delaque gang of my own. 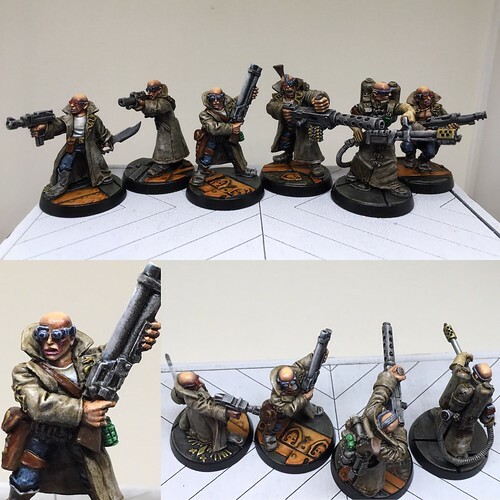 In the photo montage immediately below are the first 6 models I painted. 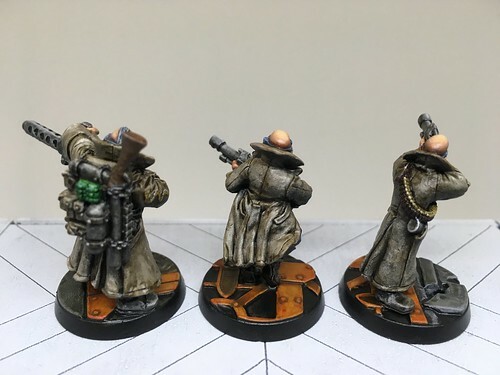 All but the flamethrower dude are old GW figs I got from an eBay seller in Serbia. 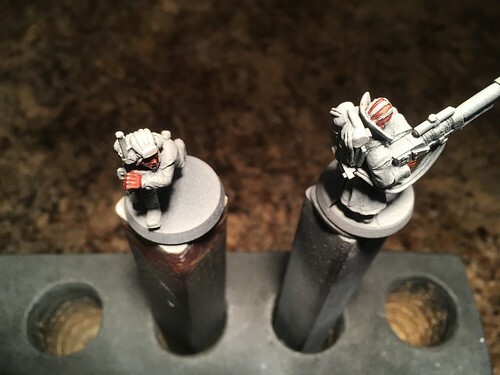 The flamer guy is from Heresy Miniatures. 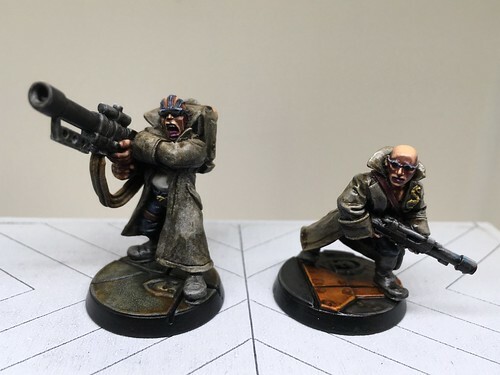 For the purposes of Necromunda gaming, the models are being used as (from L to R below), a Juve (probationary gang member) with an autopistol (i.e. 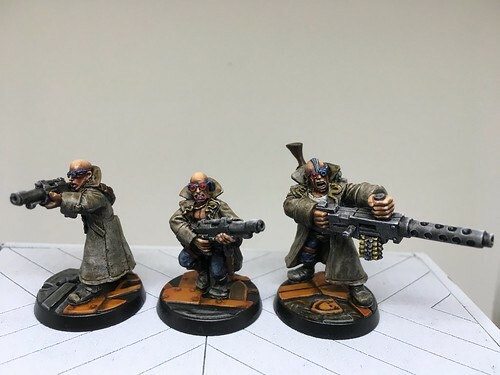 machine pistol), a ganger with a lasgun, the gang's Leader with a shotgun, a Heavy (specialist) with a heavy stubber (think MMG), another Heavy with a flamer, and finally a second ganger with a lasgun. I weathered the fuel and propellant tanks with various dings and rust stains. 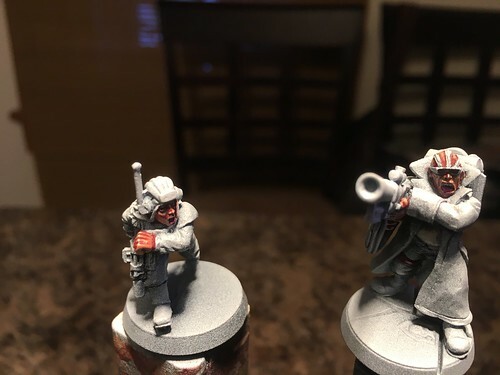 After the first batch of 6 were done, I painted another Heavy (armed with a lascannon, he was the last figure from the fellow in Serbia), and another lasgun guy (from an eBay seller in Spain). 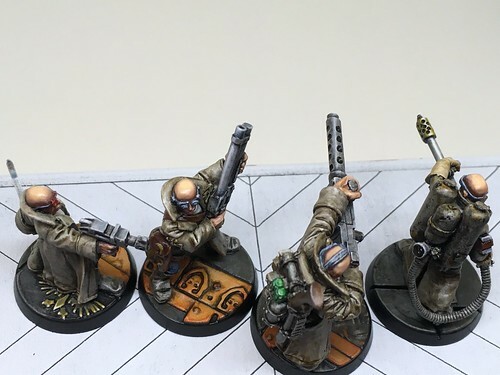 In the 40K/Necromunda game background, laser weapons are very reliable. However, a lascannon is very expensive, and such an antitank weapon is likely overkill in an environment where just having a decent basic rifle is a big deal. 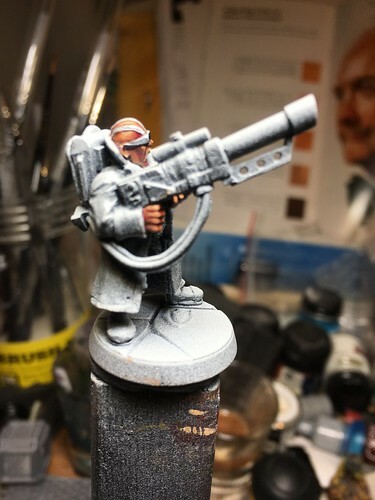 I started with my usual zenithal highlighting, airbrushing Testors Acryl Flat White over a base coat of P3 Black Primer. 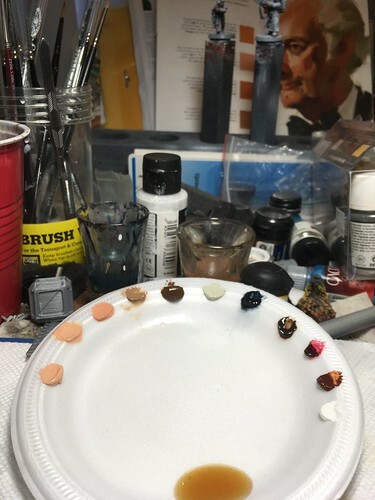 I then used the Vallejo Face Painting acrylic set, followed up by artists' oils for their faces and hands. Citadel glazes and Vallejo Black and White set was used for clothing. For the steel and brass bits, I used the Vallejo NMM set. I find that NMM for me is just as fast as painting with actual metallic colours (metal powders in a suspension), which I would highlight and shade anyways. 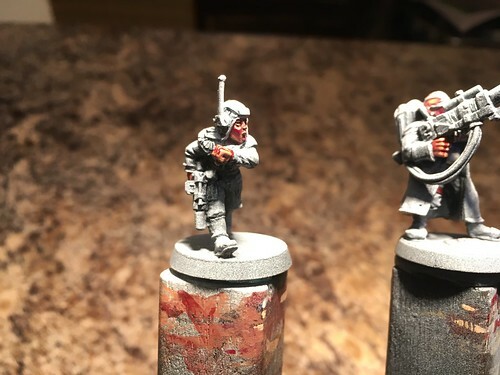 The plastic 25mm bases are from the GW Sector Imperialis set. Lots of Vallejo Rust wash for the bases. The figures were sealed with Tamiya Semi-gloss spray. 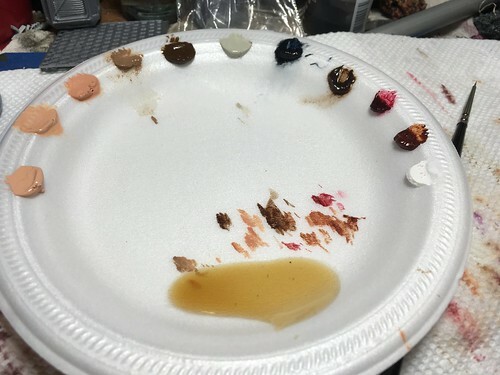 Below is the palette of oil paints I used for painting the flesh tones of the lascannon guy and a long-primed tank crewman I had sitting around. Various Winsor and Newton, Schminke, and Sennelier professional artists' oils in tubes. Also there is a splash of Winsor and Newton Liquin medium, to aid paint flow; I sometimes also use some walnut oil. 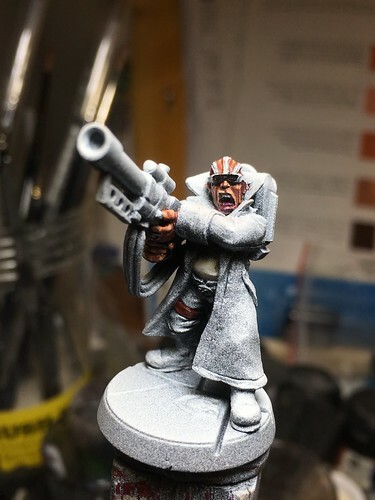 Below, after painting the Delaque lascannon guy and the GW tanker, the palette now shows the colours I used to blend and glaze flesh tones. 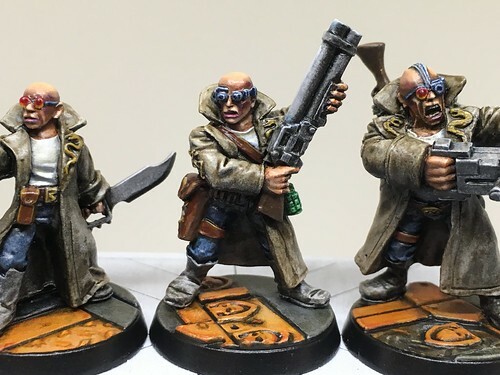 Stunning work- made me nostalgic for the Delaque gang I had back in the 90s. No where nearly as nicely turned out as yours though.